My running buddies. I’ve got a great group of friends and we support each other. To qualify and run the Boston Marathon. To finish a 100 mile run. I run to stay in shape and stay heart healthy. I started running a little over a year ago to get into shape. I was 235 lbs and not happy with myself so I picked up running. 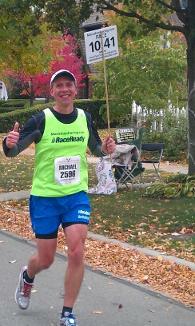 In a year I have lost 60 lbs, finished 2 marathons and a 55.5 mile ultra marathon as well as several half marathons. I do it for my health and for my family. My first Ultra Marathon. 55.5 miles. At about mile 45 I was at a point I had never felt before. I had pushed my body to a point it had never been before but I pushed on and with 3 miles to go I felt this renewed energy that said I’ve got to press on!! I did and finished 3rd overall. Something I will never forget. I pace to help other runners meet their goal whether it be just to finish or to meet a specific goal. I pace because I enjoy it and I love to run. I have a lot of energy to keep you motivated. You can see my passion for running and I will help you reach your goal. I’ll keep you motivated and we will have fun doing it. We will have fun. That’s what it’s all about. Staying in shape and having fun doing it. I am a run nerd. I run all the time, every day. I never take a day off from running. I haven’t missed a day of running since November 23, 2011. At least 1 mile every day. You always have time to run!! Very supportive of organization called Run for Roses. It was a 65 day running pilgrimage to spread awareness, raise funds, and share stores of Cystic Fibrosis. My friend Colleen Caul ran 1000 miles for 65 straight days, across 7 states for 1 dream. Cure Cystic Fibrosis.